In this past few months, I’ve had an increase on consultations with clients’ Facebook Fan Page strategies, optimizing Twitter and its potential, and even Facebook advertising over Google Adwords! So it is obvious to me that Sales and Marketing teams are seriously looking at Social Media. However, I am seeing 3 trends in enterprise software in the CRM space to improve productivity and ultimately increase sales. The first point, Engagement, is what the Yammer CEO calls “Yammer copycats”, and he is referring specifically to Salesforce’s Chatter. User engagement is the driving force behind Facebook and Twitter. The second point, Reputation, refers to the social media frenzy including the recent Radian6 acquisition. If your brand is important to you, then you should be concerned about what people think of you, your product and your company. 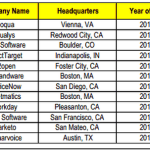 Radian6 was the clear winner in this department at Dreamforce 2010 and it’s no surprise they were acquired. Why focus on people you don’t know? Why not focus on who you should know. The old cliché “it’s who you know” still holds true today. The core feature of BranchIt for Chatter uncovers relationships held by employees, but it also includes contact syncing, relationship strength scoring, and contact & account following. You may never have to make a cold call again as you obtain personal introductions to contacts from colleagues. In the last quarter, BranchIt has more than doubled their its base by signing on over 20,000 new business users including Bell Aliant, Penske, Enterasys Networks, Freeman, and William Blair. While it is common to see industries that rely heavily on relationships use this software, it should be no surprise that other industries and markets are using this service as well. Unlike LinkedIn, Gist and Xobni, which provide similar versions of relationship management technology intended for the single user to manage his or her own contacts, BranchIt is sold only to businesses, as it harnesses the power of your company’s relationships. There are some shortcomings, for example, the need to capture phone calls into your CRM, but with VoIP and conference calling integrated into your CRM and Chatter in the future, it will only be a matter of time. Then it just becomes more powerful. I hate to say this again, but it’s not what you know, it’s who you know.